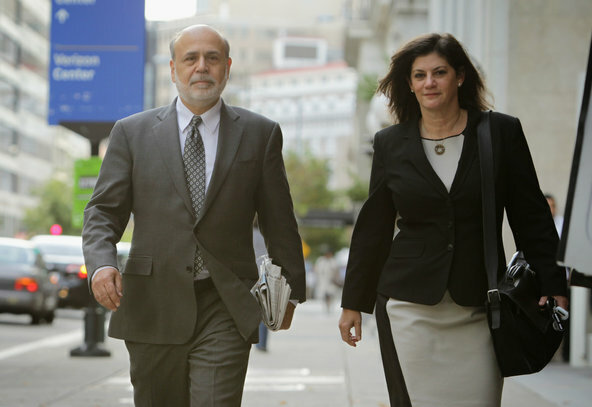 WASHINGTON – Ben S. Bernanke, a former chairman of the Federal Reserve, was not the most cheerful of witnesses on Thursday as he took the stand in the lawsuit over terms of the 2008 bailout of the insurance giant American International Group. Mr. Bernanke gave terse and clipped responses to questions, many times just a “yes, sir” or “no, sir.” He affirmed that the global financial system had been on the verge of collapse in September 2008. He agreed that A.I.G.’s collapse would have been “basically the end” of the financial system, so connected was it to other parts of the financial world. But Mr. Bernanke did not agree with the notion — a central part of the lawsuit — that A.I.G. got a raw deal from the Federal Reserve, or that it could have gotten a better deal elsewhere. “It was evident from the fact that the board took the Fed’s offer that they didn’t have a better offer,” he said, referring to the vote by A.I.G.’s board approving the government’s loan, and its terms. Maurice R. Greenberg, A.I.G.’s former chief executive, is suing the government, claiming the terms of the 2008 bailout, which started at $85 billion and grew to $185 billion, were too harsh. The suit seeks $40 billion in compensation for A.I.G.’s shareholders, and claims that the government overstepped its authority in demanding an initial 79.9 percent equity stake and combined 14 percent interest rate in return for its bailout loan in September 2008. The government has responded by calling A.I.G. shareholders ungrateful for the billions in taxpayer money used to rescue their firm when no one else would, saying that the Fed’s intervention was legal and appropriate. If he had been hoping to get his day in court over with quickly, he did not get his wish, unlike a former Treasury secretary, Henry M. Paulson Jr., who was on the stand less than two hours on Monday. On Thursday, testimony by another former Treasury secretary, Timothy F. Geithner, continued longer than expected, until nearly noon. Mr. Bernanke was left to bide his time in a side room. Just before he was called into the courtroom, the former Fed chairman emerged from the side room and paced back and forth in the fifth-floor hallway at the Federal Court of Claims. Despite persistent questions from Mr. Greenberg’s lawyer, David Boies, Mr. Bernanke either did not recall, or was not particularly knowledgeable about, the specifics of how A.I.G.’s bailout terms came together in September 2008. Instead, he said, he largely followed the lead of the New York Federal Reserve Bank and its president at the time, Mr. Geithner. Even on Sept. 17 of that year, when the Fed had already begun extending money to A.I.G., but before the ultimate deal structure was completed, Mr. Bernanke said he was not aware of whether the agreement would call for a voting equity stake. “I assumed that the agreement would be a binding agreement, but I left the details to the legal team,” he said. Asked when he first found out that the deal would involve a controlling equity stake, Mr. Bernanke said he did not remember. But he did remember that A.I.G.’s state of affairs was dire, even after the first $85 billion loan was made available. Only several weeks later, Mr. Bernanke said, the insurance giant was almost bankrupt again, and needed not just a restructured Federal Reserve loan but also an infusion of capital from the newly approved Troubled Asset Relief Program, or TARP. “I think the company did worse than I anticipated,” he said. Also discussed in court on Thursday was the Fed’s secretive “Doomsday Book,” which supposedly catalogs the special emergency powers of the central bank, dating back to the Great Depression. The Fed wants desperately to keep the book out of public view, and on Thursday, Judge Thomas C. Wheeler heard brief arguments from both sides on whether the two versions of the book that sit in evidence should remain under seal. It was uncertain when Judge Wheeler would rule on the issue, but he made clear on Thursday that the Doomsday Book could indeed potentially hold important information for the case — considering that Mr. Greenberg’s suit largely rests on whether the Fed had the authority to engage in practices like taking an equity stake, as it did with A.I.G. “I think all of that is relevant to the case, and I don’t care if they go back to the 1930s or not,” the judge said. Mr. Bernanke, who stepped down in January as chairman of the Federal Reserve, and was succeeded by Janet L. Yellen, was scheduled to take the stand again Friday. Lawyers said he was likely to be questioned for the entire day. It remains unknown what Fed email pseudonym Ms. Yellen may have chosen for herself. Posted on October 14, 2014, in Postings. Bookmark the permalink. Leave a comment.